The glory that you are currently beholding is one of the largest vintage child car seat collections in the world. Trust us, this is way more interesting than it sounds. A Jalopnik reader named Scott has spent the last 30 years collecting nearly 100 vintage car seats, some of which, he says, have even been featured in blockbuster Hollywood movies. Here’s what this world-class collection of old and quirky car seats looks like up close. Back in 1971, Scott was involved in a car accident in which his mother smashed into the windshield of his family’s 1960s Plymouth Satellite, and he—sitting directly behind her—flew into the back of her seat (both only sustained minor injuries). It was during this accident that Scott noticed that his friend, who was fastened next to him in a child seat (which looked like nothing more than a lawn chair with a tubular c-shaped arm rest—see image to the left), ended up completely unharmed.“This funny little contraption; it did something!” Scott thought, and from that moment on, he was in love with child safety seats. That accident had such an effect on Scott, that he at one point wanted to design child safety seats when he got older, even applying for a mechanical engineering program at a college and getting accepted. And while Scott didn’t end up pursuing that dream, after picking up some old seats from the curbside and then on Ebay, he managed to accrue perhaps the largest collection of vintage car seats in the country. 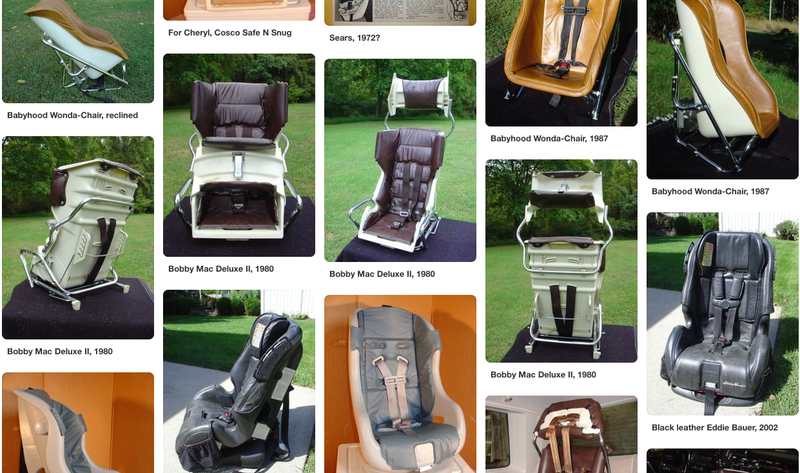 Scott stores the herd of car seats in his attic, but displays them to the world through his Pinterest Page, Vintage Seats, using the handle Bobby MacDonald (named after one of his favorite vintage car seat brands, Bobby-Mac—you can see one in the top photo). There, his collection has garnered so much attention that production companies have reached out to rent the seats for use in movies. Scott told me the Evenflo Dyn-o-mite infant seat shown in the image to the left has been his most requested car seat, having even been featured in the Reese Witherspoon film “Hot Pursuit” and set to be used in the upcoming “Shaft” movie as well as “The Shade Shepard.” Scott told me his vintage seats have also been borrowed for court cases, and for research meant to understand how a car seat might have affected the outcome of an accident in the past. Scott even asked if he was scaring me off with his copious photographs of car seats, but of course, as unique as I find Scott’s passion, there’s no way I find it off-putting; in fact, I sort of get it. If he were collecting modern car seats, perhaps then I might be a bit confused (Scott’s collection includes seats from between the ’50s and 2000s, but the few from this millennium he uses “mostly for comparison to the old ones.”), but the vintage seats in Scott’s collection are not only visually stunning pieces of art, they’re functionally fascinating. We’ll start with Scott’s 1950s-era Kiddie Drivette, a seat that really exemplifies the state of child safety technology (and just general car technology) before the 1960s. It’s essentially an elevated chair meant to keep kids from moving around and to help them see out of the window. The Drivette simply hooks over the seat back, and the child sits fastened via a small belt on the elevated platform. The whole contraption really offered no real safety benefit. General Motors’ setup, the “Infant Love Seat,” was quite a bit different than Ford’s design in that it had the child facing backwards, and used a Y-shaped shoulder strap, along with the car’s lap belt—which went through the two notches on the sides of the polypropylene body—to hold the child in place. The seat was forward-facing, and secured to the car via the lap belt that went over the plastic body, as well as a “special top strap” that anchored the top of the seat from the back. The child was held into the seat with a five-point harness. But even if Ford’s Tot-Guard and GM’s Love Seats were the high volume sellers, there were tons of other interesting designs out there, like this amazing chrome and red one called the Firestone Protect-A-Tot, which used a shield to protect the forward-facing child, just like Ford’s Tot-Guard did. It’s definitely worth checking out Scott’s full collection, because I haven’t even scraped the surface in this article (for example, the collection also includes a bunch of vintage advertisements and pictures of seats with children in them, both of which Scott has amassed over the years in a quest to fulfill his car-seat obsession). There really are some wild seats that just make you scratch your head trying to figure out how they work. Especially these days, people are adamant about throwing away obsolete or even “expired” child seats, so it’s no surprise how rare vintage seats have become. For Scott to have a collection of 100 is mind-blowing. But I, for one, am glad he does. It's OK To Be A Little Weird Around Here.